quick-thinking, fast-talking playground rat in junior high, he already stood 6–5 when he enrolled at Hudson Catholic. There he was a friend and teammate of Jim Spanarkel’s. Both flourished under the tutelage of Rocky Pope. By the time Mike graduated, he was one of the top all-around high schoolers in the nation. He might be the only player ever recruited by Frank Sinatra. UNLV coach Jerry Tarkanian wanted Mike badly and convinced Sinatra to pay Mike and his mother Rose a visit at their Jersey City home. Despite this full-court Vegas press, Mike chose to go with Dean Smith and the University of North Carolina. Mike joined an immensely talented Tar Heels squad that featured future NBA stars Phil Ford and Walter Davis. Mike proved to be the perfect complementary player. He averaged 13.9 points as a freshman and when opponents clamped down on Ford, Davis and senior Tommy LaGarde, he provided important points. In the 1977 ACC Championship Game, Mike had the first of many back-breaking performances against arch-rival Duke, lighting the Blue Devils up for 21. The Tar Heels continued to roll in the NCAA Tournament, winning close games against Purdue, Notre Dame and Kentucky to make it into the Final Four. Mike had another magical game in the national semifinal, against UNLV, dropping 31 on the Runnin’ Rebels in a riveting 84–83 victory. The 1977 NCAA Final pitted UNC against Marquette. For Hudson County basketball aficionados, it was Mike against Jimmy Boylan, a fellow Jersey City playground star who was a couple of years ahead of him. The Tar Heels got the lead in the second half of a see-saw game and Dean Smith ordered his players to go to the vaunted Four Corners offense. The Warriors kept their cool, regained the lead and won the NCAA title 67–59. Mike scored 14 points and grabbed 11 rebounds before fouling out. Mike boosted his scoring to 17.8 points per game as a sophomore. Although not a vocal leader, he rarely took a bad shot and was a remarkably consistent scorer. 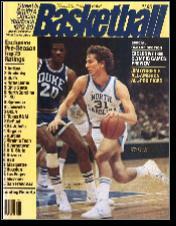 In 1978–79, Mike teamed with Al Wood and Dudley Bradley to lead the lightly regarded Tar Heels to 23 wins. They won the ACC Championship, as Mike scored the final 10 points in a 71–63 UNC win. Mike graduated as the first Tar Heel with 1,500 points, 800 rebounds and 300 assists. As of 2014 he was still the only Tar Heels to achieve this combination. A two-time Second Team All-American, few college players could match Mike’s all-around game, which included shut-down defense and amazing movement away from the ball. He could start or finish the break, run the offense from the top of the key, or cut to the hoop for unmolested backdoor layups. Those skills earned Mike a first-round selection in the 1980 NBA Draft. He was taken along with Duke center Mike Gminski by the New Jersey Nets, who had the sixth and seventh selections. The Nets also picked up Rory Sparrow in the third round—not a bad haul for what was considered a weak draft. Mike ended up playing all but 15 games of his 8-year NBA career with the Nets. He both started and came off the bench for New Jersey, playing both forward and guard. Mike averaged 11.0 points, 6.1 rebounds and 3.2 assists as a rookie. His top scoring season came in 1981–82, when he was fourth on the club with 909 points. The Nets in the early ’80s were led by power forward Buck Williams and Albert King, a swingman who took minutes away from Mike. Mike also lost time to injuries, including sore knees. Mike got into coaching after retiring from the NBA. He rejoined the Nets as an assistant coach in 1999, helping the club reach two NBA Finals. He then filled the same role for the Washington Wizards from 2005 to 2008. In 2009–10 he joined the staff of the Philadelphia 76ers. Mike’s pro coaching career has been closely tied to that of Eddie Jordan’s. Both were assistants with the Nets and Jordan was head coach both in Washington and Philadelphia.